Welcome guest author, Sharon Lathan to History Undressed! I spent many a summer in my youth in France and I LOVE Paris AND this time period, so I'm especially excited for you all to read Ms. Lathan's post today! Please leave a comment for your chance to win a copy of Miss Darcy Falls in Love. (1 winner, US/Canada only). Whether you have been to Paris or not there are certain images that instantly flash in your mind when the ancient city is mentioned. So ingrained are these visions of what Paris IS that perhaps you might be surprised to learn that many of the iconic Paris sights either did not exist 200 years ago or were vastly different. 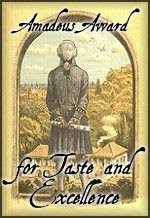 My latest novel - Miss Darcy Falls in Love - is set in 1820. At that time Napoleon Bonaparte was in exile on the island of Saint Helena and the Bourbon Restoration was underway with Louis XVIII on the throne. There was a measure of stability, but the long decades of war and revolution coupled with the major political upheavals ongoing meant that France was far from peaceful. Paris, as the capitol, showed the greatest evidence of the numerous trials. Scars were visible at every corner despite Napoleon and Louis’ attempts to reconstruct, and disorganization was constant. It would be many decades more before Paris truly became the glittering city it now is. Nevertheless, in 1820 life for the Parisians was near perfection compared to the previous thirty-some years. Opera, theatre, arts, and social activities abounded. Yet, as I said, many of those places now top tourist traps were not available to Miss Darcy and her friends. Eiffel Tower: Today it is the tallest building in Paris and one of the most visited monuments in Europe, but it was not built until 1889. The large flat open park called the Champ de Mars, where the Tower stands, had served as a site for executions during the Revolution and military training, but by 1820 was a popular park for festivals and other celebratory events. Musée du Louvre: Originally a palace and fortress, the Louvre was transformed into a public museum during the French Revolution, the royal collections viewable for the first time. Located close to the Tuileries Palace, the Louvre Palace was structurally renovated several times during the 17th and 18th centuries, it’s general splendor as we now see it. However, in the early decades of the 19th century it was far smaller than it now is and held considerably less works of art. All through the century vast wings would be added on to house the flood of art arriving from all over the world until it eventually became a massive complex with the palace only one portion of the whole. So huge is the present day Louvre that it cannot be captured in one photo. When Georgiana and Sebastian tour the Louvre it is still a seat of royal power with the Tuileries standing, already supremely impressive as a museum, and undergoing constant construction. Arc de Triomphe: The monument to honor those who fought and died for France in the Revolutionary and Napoleonic Wars was conceived in 1806. The foundations were laid in 1810 but construction halted during the Restoration, the final structure not completed until 1836. Therefore, my characters would not have seen this marvel. Instead they stroll through the Tuileries Gardens and pause at the smaller Arc de Triomphe du Carrousel. Built in 1808 by commission of Napoleon to commemorate his military victories, the lesser Arc was nevertheless an impressive sculpture and integral part of the axe historique (grand historic axis) of Paris. 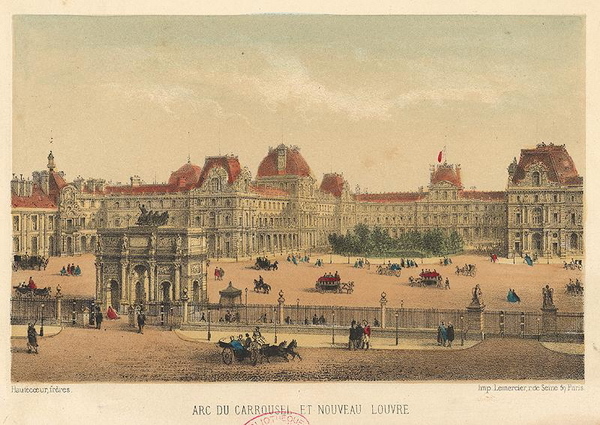 Pictured here you can see the Arc with the Louvre behind as it would have looked in 1820. 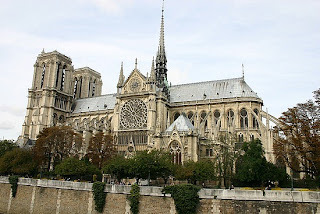 Notre Dame Cathedral: Completed in 1250, Notre Dame is the “World Ambassador of Gothic Cathedrals.” For seven hundred years it has stood on the site of ancient sacred ground, revered and generally well cared for except during the years of the Revolution. 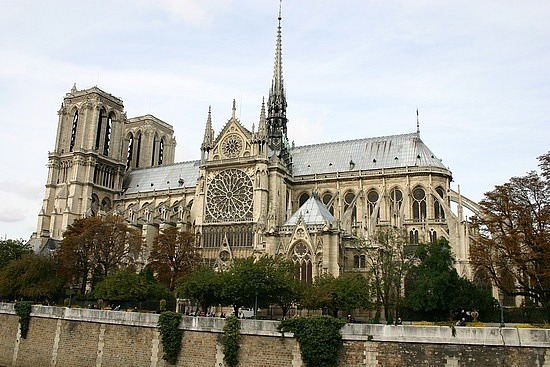 Churches in France were universally rededicated to the “cult of Reason” and Notre Dame suffered severe defacement, destruction, and desecration. Until the mid-19th century the cathedral was ignored as a house of worship, used instead as a storage facility and place for public gatherings. It is unlikely that Miss Darcy, or anyone visiting Paris in 1820, would have taken the time to visit the ruined Notre Dame. Other famous attractions not in Paris at the time of my novel include Cleopatra’s Needle (1833), Elephant of the Bastille (the fountain and model elephant were present by 1814, but the elephant not completed until 1833 and has since been removed), the Sacré-Coeur (1873), the Moulin Rouge (1889), or the Opéra de Paris Garnier. Do not feel sorry for my characters though! They did visit the Louvre and walked the Tuileries Gardens. They also toured the Panthéon, rode down the Champs-Ėlysées, saw the exotic animals and plants in the Jardin des Plantes zoo and botanical gardens, and socialized along the pathways of the Place de la Concorde. Did I mention the opera houses, salons, ballrooms, and palatial chateaûs? Paris of 1820 may have been in moderate chaos and a paler version of what it now is, but the City of Light was phenomenal nonetheless. And the perfect place to immerse in music and fall in love. Noble young ladies were expected to play an instrument, but Georgiana Darcy is an accomplished musician who hungers to pursue her talents. She embarks upon a tour of Europe, ending in Paris where two very different men will ignite her heart in entirely different ways and begin a bitter rivalry to win her. But only one holds the key to her happiness. Set in post-Napoleonic Empire France, Miss Darcy Falls in Love is a riveting love story that enters a world of passion where gentlemen know exactly how to please and a young woman learns to direct her destiny and understand her heart. Wow, great information on French history. And Miss Darcy Falls in Love sounds fascinating. Good luck with your book. Good morning everyone! Hi Callie!! I am still waking up, drinking my latte, and sharing this with everyone on the web. 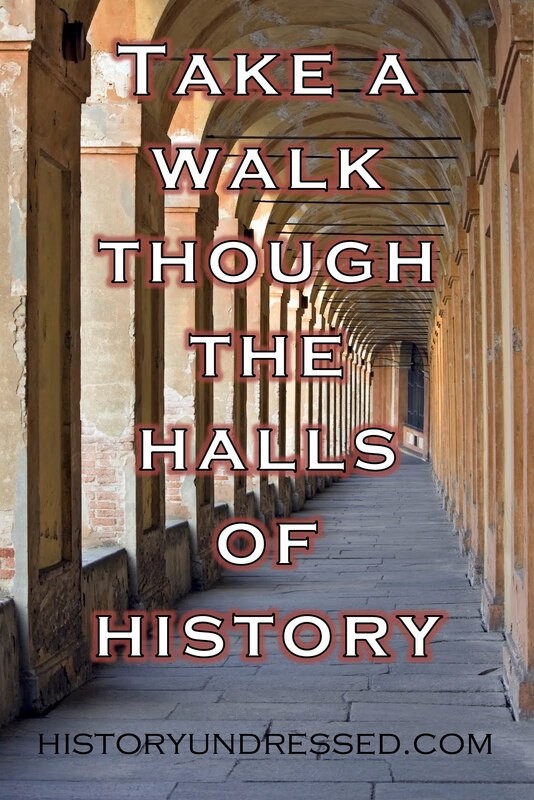 I am so excited to be here on History Undressed talking about one of my favorite subjects - history! I hope everyone enjoys the blog. I'll be checking in periodically to respond to any questions folks may have. Fire away! I love Paris and have spent a lot of time there. It is great to see the old pictures of it. A very enjoyable and informative post, Sharon. Thank you for sharing. OHH, this sounds like a fascinating book. The cover is beautiful. I love books set in Paris during this period. What an interesting post. It sounds like a time of transition which must have had a unique feel to it for people living there. Ella, I am a bit jealous that you have been to Paris! I sure wish I could go, although a trip to England will come first. Thanks for commenting. Joya, I have a "thing" for old images and painting. I search high and low sometimes to find ones that fit my era. It can be a challenge. Thank you Gerri. I am glad you enjoyed it. Hi Angela! Paris is always an exciting place. I was a bit disappointed at first to learn that so many of the iconic places were not as we imagine, or simply not there. But then I realized how interesting a time it was in so many other ways that it did not matter. Hello Maureen. Indeed you are correct. If I had been writing a political novel I could have gone crazy based on the turmoil in France at the time. Some of that affected the arts so I do touch on it to a degree, but I was keeping the focus on Georgiana and Sebastian. Thanks for commenting! What a wonderful post! I love Paris and it's fascinating to see how it changed through the year. Thanks. A very interesting post! Miss Darcy Falls in Love sounds like a great story. I was most intrigued by the title of your new work titled, History Undressed. Brilliant title. I can't wait to read it. I became a fan when I read Mr. and Mrs. Fitzwilliam Darcy. This work is such a beautiful portrayal of love, cherished and sensuous and so perfect in every way. You have inspired me to continue my work. You mentioned something about two short stories, The Wedding and The Honeymoon. Are these available??? I stand in awe of your talent. Thank you. Hello Roger. Thank you for your kind words. I am very happy that my novels have been so thoroughly enjoyed! As to the short stories, I am not sure what you refer to. Looonnngg ago when I was still writing online my first bit (which I thought would be a single writing since I had no clue what I was doing) was called "The Wedding Night". It is now a chapter in the first novel, more or less. From there I went on and eventually all those small portions ended up within the chapters of my books. The only actual novella I have published is in the anthologyA Darcy Christmas. 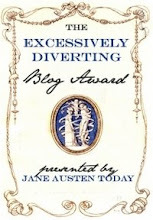 I have written a few fun essays since then, such as An Interview With The Darcys (which is now on the Austen Authors Writers Block) and my recent contribution to our P&P200 event: Georgiana Darcy Receives a Letter from her Brother. But that is it. Hope that helps, and thanks again for your comments. It is much appreciated. I can't wait to read this one. I have always been curious to see what happens to Georgiana. And the random winner is... Roger! Please email me at writer@elizaknight.com!